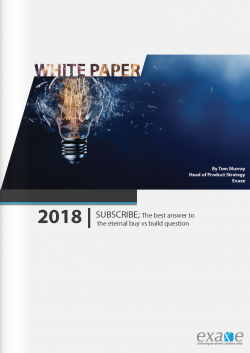 Exaxe releases a series of white papers throughout the year. You can find many of our white papers below. 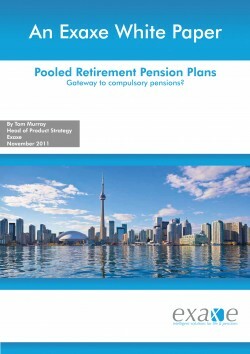 Pooled Retirement Pension Plans – Gateway to compulsory pensions? RDR – The Return of the man from the Pru? Buying in brings the benefits of a shorter time-frame and proven capability. It removes the risk of ending up with nothing, although the percentage fit with the business’s requirements may take a hit. Buying in can also leave the company hostage to the vendor and its product roadmap, and will certainly incur a major up-front investment before the benefits can start to flow. Alternatively, building the solution in-house ensures a good match with the business’s needs, and benefits from the internal store of knowledge built up over the years in understanding those requirements. However, on the negative side, it may be taking the IT department into technology areas which are not its comfort zone, it may ossify the current business approach rather than forcing it to be justified, and it will almost certainly take a longer time to start to pay-back, as the solution must be built from scratch as opposed to benefiting from technology that has already been created. It also might mean that the company loses out on benefits that come from an external view of the market rather than from an internal view, which may have become blinkered over the years. Traditional life and pension companies are under tremendous pressure to change. Government policy is firmly set to nudge, if not push, the public into taking greater responsibility for its financial welfare. This has led to a change in the number of people looking to buy financial products and the type of products they are looking to buy. At the same time, use of technology has become ubiquitous in everyday life, triggering a step change in how consumers seek to interact with businesses. Administration systems supporting life and pension companies must be able to offer the service levels expected by today’s consumer. Sadly, many companies in this sector are still administering their business on systems that were designed for a completely different era, a world where people were expected to fit in with the needs of the business rather than the other way around. The life and pensions market was traditionally a slow moving market, with a small number of established players whose business model had been the same for generations. Business processes were preserved much as they had been in the pre-computer era. Consequently, the demands upon the provider’s supporting infrastructure were low. Turnaround time for the purchase of a new policy was measured in days rather than seconds. Requests for valuations of existing policies could take weeks or even months. Even today, many firms operating in the sector still base their customer services on processes designed for administration systems from that era, i.e. 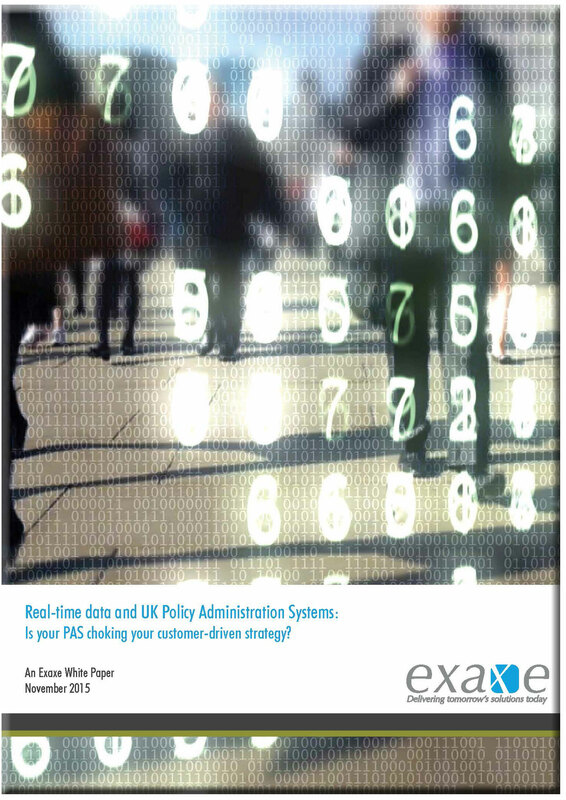 policy based systems rather than customer based systems. Those who have upgraded to newer administration platforms are often shackled by the fact that the new systems are designed based on assumptions prevalent in the previous era. Thus, many life and pension companies find it difficult to respond to the more demanding business environment of today. ffective way ought to be at the forefront of every life and pension provider’s strategy for the future. The Australian government’s plan to change the way financial advice is paid for, “The Future of Financial Advice (FoFA)”, is moving relentlessly forwards. In just sixteen months commission will be banned for investment products and providers will need to support adviser fees in order to remain in the market. Providers need to start initiating projects to ensure their organisation is compliant with the new regulations. Although the finalised version will not be available until mid-summer, the majority of the detail is now available. There is a high risk of underestimating the work involved. In the UK, where a similar piece of legislation -The Retail Distribution Review (RDR) – is being enacted, providers are concerned as the extent and ramifications of the changes become clearer. Australian providers will soon discover that FoFA legislation will be a much bigger game-changer than they initially thought. The key issue is that both advisers and providers assume new roles. The linking of payment to advice ensures that advisers are now focused on providing an advice service. For providers, the shift is from satisfying distribution channels to focusing on providing suitable products to the end-consumer and to support the IFA base in the provision of advice. Two approaches can be taken; a minimalist one to achieve compliance or a strategic one to position the provider as a major player in the new FoFA world. In too many cases, a minimalist approach is being taken – a sticking plaster to cover the wounds of inefficient, disparate systems that cannot provide coherent support for future distribution channels. FoFA provides the perfect opportunity to improve creaking areas of the business, which have suffered from neglect over the years. Many of the products currently on sale are no longer suitable and will be retired or replaced. A more defined set of products supported by streamlined and efficient processes will provide a compelling reason why advisers should recommend a particular provider’s products as the solution to their customers’ financial requirements. Leveraging the work mandated for FoFA to improve your products and services will maximise your return on your spend and position your company to be a profitable player in the emerging advice-driven market. The start date for RDR is creeping up on us. In less than 2 years, all commission will be banned for investment products and providers will need to support adviser charges if they wish to remain in the market. All providers have been compelled to initiate expensive projects for the introduction of the new regulations. But what tangible benefits are they getting for this expenditure? Is it just a case of doing the minimum to achieve compliance or is the opportunity being taken to streamline the business processes and systems to make the company flexible and responsive in the dynamic post-RDR world, with its continued regulation creep? These questions should be to the forefront of the mind of anyone involved in the preparations for RDR compliance. In too many cases, a minimalist approach is being taken – a sticking plaster to cover the wounds of inefficient, disparate systems that cannot provide coherent support for the distribution channels into the future. RDR provides the perfect opportunity to improve creaking areas of the business, which have suffered from neglect over the years. The number of IFAs will undoubtedly fall dramatically, due to the changes in qualifications needed and the absence of grandfathering. Many of the products currently on sale are no longer suitable and will be retired rather than refashioned for the new era. These reductions both in the size and makeup of the distribution market and the removal of older products from the providers’ offering make it the perfect time to streamline systems and processes in order to be in a position to grow dynamically post RDR. A more defined set of products supported by streamlined and efficient processes will provide a compelling answer to the question of why IFAs should recommend a particular provider’s products as the solution to their customers’ financial requirements. This enables providers to efficiently assume their new roles as product and service providers to an advice-led industry or as direct retailers to the larger consumer market now outside the advice arena. Leveraging the work mandated by the FSA for RDR to improve your products and services will maximise your return on your spend and position your company to be a profitable player in the emerging post-RDR world. Pension providers are already deep in planning for the changes that will be wrought by the arrival of personal accounts, (now rebranded NEST – the National Employment Savings Trust), in 2012. The arrival of NEST amounts to a complete revolution in pension planning for ordinary people who currently make no pension provision. This is causing a lot of midnight oil to be burned as pension providers try to predict the likely landscape post-2012 and to position themselves for it. However, these plans may all be for naught as there are straws in the wind that current government plans may be in trouble. 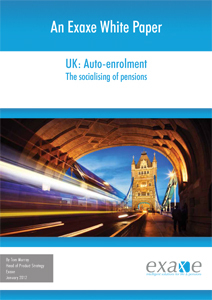 The scale of the change to theUKpensions market is unprecedented, with huge amounts of middle and lower income people being auto-enrolled into pension schemes which will dramatically increase the size of the market. Although opting out is possible, the automatic re-enrolment after every 3 years will result in it being harder to stay out than to go in. As a result, by 2020, the majority of the working population in the UK will be a member of a pension scheme of some sort. The setting up of NEST by PADA, the Personal Accounts Delivery Authority, is a dramatic change, with a government sponsored body becoming a player in the market with the pension providers for the first time. The government scheme is likely to be very popular with smaller companies on the basis that it is being run by a not-for-profit trust and that joining it will ensure legal compliance by default. The other new factor is the compulsory contributions from the employers. The likelihood over time is that it will drive down wages across the smaller firms, where there is currently least pension provision, leading to lower paid workers opting out in order to maintain their living standards. The results of the FSA’s Retail Distribution Review (RDR) are now finalised. The main recommendations of the consultation paper have been left intact and it is clear that life and pension providers are going to have to make significant changes in order to implement it. The Retail Distribution Review covers a number of areas, many primarily effecting IFAs and networks. There are however some key recommendations of the review which will have a direct and immediate impact on the market for investment products. These recommendations proposed by the FSA will create changes within the market for regulated investment products and as a result will require product providers to react. Already, providers are reviewing the market and looking for opportunities to capitalise on their strengths in the new market-place that will emerge post RDR. It is vital for insurers to organise their strategy for dealing with the post RDR market, as the regulations are dues to come into full force by the end of 2012 and many may come into force earlier. While the focus of discussion about the RDR proposals has been on the affect of the changes on the IFA community, the fact that these proposals are likely to leave the mass market for financial investment products without financial advice has been glossed over. This whitepaper looks at what we believe will be a key outcome of the RDR changes; the removal of independent advice from the mass market segment, the options that will remain to service that segment of the market and the possible re-emergence of a distribution channel that has been in severe decline for the last two decades – the direct sales force (DSF).Effect of Key RDR recommendations on the market. The Retail Distribution Review proposes a number of changes which will lead to a radically different environment and will give rise to opportunities for providers to re-position themselves for success within the new investment product retail environment. Some of these changes will dramatically change the market for advised sales, disrupting the current landscape. If we look at the main changes we can see how a whole segment of the market is being left to its own devices, giving a big opportunity to any provider who is willing to plug the gap.